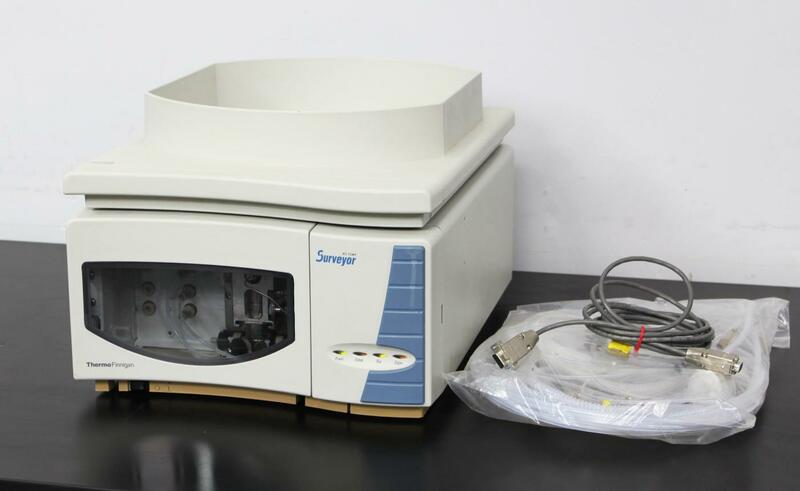 Thermo Finnigan Surveyor MS Pump SRVYR-MPUMP HPLC Mass Spectrometry . New Life Scientific, Inc.
lower flow rate ranges needed for mass spectrometry. which would need to be provided by the end user. instrument to complete initialization and enter a “Ready” run state. wear, including a couple small scuffs, scatches, and drip stain on the front panel. The interior compartment is in especially good condition with little sign of spillage. a “Ready” run state shortly after being powered on. is building vacuum”. A flashing Amber would indicate failure, which it does not do.